Car accidents are an ordeal for everyone. They’re traumatic for the people involved, of course, but they also affect everyone else on the road. The more serious the incident, the more likely that multiple lanes will be blocked, and the longer it will take to get it cleared. The police officers at the scene have one of the most difficult jobs of all. They have to measure and map the scene and the vehicles in scrupulous detail so that the courts can get a clear picture of exactly what happened. To add to their challenge, they have to do all of this in the middle of a busy, backed up roadway. Fortunately, there’s an easier way to get all the information at an accident scene than walking around taking painstaking measurements – by using photogrammetry to map the scene instead. Your camera can help you gather all of the important information quickly and accurately, so that you can clear out faster and get traffic back to normal. Photogrammetry uses photos of the scene from different angles taken with a standard camera. A trained expert can go back and look at the photos later to reconstruct and map the scene. Instead of measuring the scene directly, you obtain the necessary measurements from the images and the software to put together a clear, geometrically accurate picture of what happened. Not only are flat areas captured but also heights for full 3D. You can also create drawings and maps. The information from photogrammetry at accident scenes has been shown to be extremely accurate when obtained by a trained user and can be used as evidence in a court of law. The procedure has been around for decades. In fact, when legendary actor James Dean was killed in a car accident, investigators used photos to reconstruct the scene when no measurements were available. Modern photogrammetry software makes using these techniques more accessible to a wide audience. You no longer need to be a math genius to get results! The ease-of-use, modern user interface, advanced internal algorithms, digital imaging, and a wide variety of export methods make modern photogrammetry software a powerful tool for all police departments. Safety is also an issue when it comes to accident scenes. The longer you spend blocking the road and dealing with the wreckage, the more likely it becomes that more damage and/or physical harm will occur through secondary incidents, or passing motorists striking law enforcement personnel. Photogrammetry takes much less time, allowing you to collect all the necessary information safely and clear the scene much more quickly. Photogrammetry is also a more cost effective method of collecting information, particularly due to the time and man power that it saves. Because each documenting unit only needs a camera, a tape measure for a scale measurement, and optionally some photogrammetric evidence markers, it is cost effective to equip multiple teams compared to the more expensive total stations or laser scanners that have to be shared between teams due to their high price. Another advantage of photographic methods over total stations and tape measures is that you can revisit the scene on your own computer with the original scene photographs to pick up key measurements that might have been missed in the original scene documentation. 1. The documenting officer arrives at the scene with his camera (usually a good quality DSLR camera with fixed lens), a tape measure and optionally some evidence markers (plastic paddles that sit on the road surface, each with a unique letter or number). 2. The officer may walk the scene placing traffic cones or evidence markers to further simplify the processing work later. 3. The officer takes photographs from different angles and different distances. 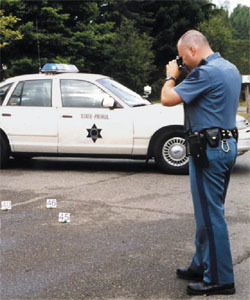 Some photographs encompass the scene, and others are closer shots to isolate specific evidence such as a vehicle, skid/yaw marks, or debris. If at night, a powerful flash will be used. 4. The officer takes a scale measurement with his tape measure. 5. The overall process is quick (minutes instead of hours with other methods), and the scene can now be cleared. 6. The digital photographs, the scale measurement data, and information about the camera that took the photos are filed according to the S.O.P. for the department. 7. At some later date, if it is deemed necessary by the courts or the department, the photographs and related data are pulled from the files, a PhotoModeler project started, and a diagram created. The two PhotoModeler tutorial videos on Road Scene Diagramming outline the process in detail. Examples of this type of work can be seen on the PhotoModeler Accident Reconstruction Application page. Photogrammetry at accident scenes is an essential tool for any police department or highway patrol. It saves time at an accident scene and increases officer safety. Photographic evidence isn’t time-sensitive, so you can come back to your work at any time and still have all the information you need. It can be used to collect data on a case from years earlier based on archived photos. It’s less intrusive than taking measurements by hand and allows you to preserve the accident scene better. It’s effective not only for accidents, but can also be utilized to obtain information from almost any crime scene. The applications of photogrammetry are endless. 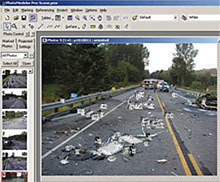 Read more about PhotoModeler, one of the leading photogrammetric software packages used in accident scene documentation around the world.